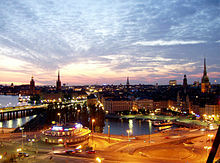 Stoccholm (Sƿēonisc: Stockholm) is sēo hēafodburg Sƿēolandes. Þǣr oneardiaþ 942,370 lēode. Man nīwanost wende þisne tramet on þǣre 01:38 tīde þæs 3 Þrimilcemōnaþ 2018.